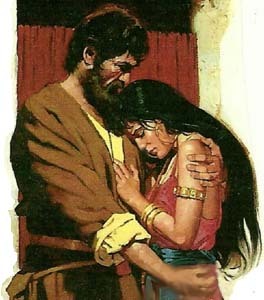 He was one of the greatest lovers in the OT, for even his adulterous wife could not kill his love for her. Ch 1 opens with a command for him to marry a known prostitute. Hosea 1:1-2 1 The word of the LORD that came unto Hosea, the son of Beeri, in the days of Uzziah, Jotham, Ahaz, and Hezekiah, kings of Judah, and in the days of Jeroboam the son of Joash, king of Israel. 2 The beginning of the word of the LORD by Hosea. And the LORD said to Hosea, Go, take unto thee a wife of whoredoms and children of whoredoms: for the land hath committed great whoredom, departing from the LORD. God tells him that this would serve as a sign. As Hosea will feel the heartbreak of being married to an unfaithful wife, so God feels toward his unfaithful bride, Isarel. In spite of their sins, God still loved them, a picture of His redeeming grace. Romans 5:8 But God commendeth his love toward us, in that, while we were yet sinners, Christ died for us. Hosea obeyed, and subjected himself to the shame and disgrace of her character. The Children of the Prophet Three children were born. Their names are also symbolic. Hosea 1:4 And the LORD said unto him, Call his name God Sows or Scatters Jezreel; for yet a little while, and I will avenge the blood of Jezreel upon the house of Jehu, and will cause to cease the kingdom of the house of Israel. Hosea 1:5 And it shall come to pass at that day, that I will break the bow of Israel in the valley of Jezreel. Jehu, a king of Israel that destroyed Baal worship in Israel, but was overzealous in killing all the family of Ahab in the Valley of Jezreel. 2 Kings 10:11 So Jehu slew all that remained of the house of Ahab in Jezreel, and all his great men, and his kinsfolks, and his priests, until he left him none remaining. God would avenge the deaths of innocent people at the hand of Jehu, and the kingdom would be scattered among the nations. Hosea 1:6-7 6 And she conceived again, and bare a daughter. And God said unto him, Call her name not pitited Loruhamah: for I will no more have mercy upon the house of Israel; but I will utterly take them away. 7 But I will have mercy upon the house of Judah, and will save them by the LORD their God, and will not save them by bow, nor by sword, nor by battle, by horses, nor by horsemen. God would no longer pity Israel, but allow them to be taken by the Assyrians, while showing mercy to Judah. The army of Assyria that destroyed Israel also attacked Judah, but they did not conquer them. Instead, God miraculously fought on behalf of Judah against Assyria when the angel of the LORD killed 185,000 soldiers in the camp of Assyria in one night. God’s expression of love is unconditional, but the enjoyment is conditional upon obedience. Hosea prophesied during the decline and ultimate destruction of the northern kingdom of Israel in the 8th century. This was when Rome was founded. After the death of Jereboam II, it was anarchy or misrule; kings made their way to the throne through the murder of their predecessors: Shallum killed Zechariah; Menahem killed Shallum; Pekah killed the son of Menahem; Hoshea killed Pekah. But, after the death of Jereboam II, two of his successors were assassinated, and Assyria would invade and take them into captivity. Hosea 1:8-9 8 Now when she had weaned Loruhamah, she conceived, and bare a son. 9 Then said God, Call his name not my people Loammi: for ye are not my people, and I will not be your God. From his name, this son may not have been Hosea’s. In the same way that Hosea denied being Lo-ammi’s father, God announced His determination to deny having any relationship to apostate Israel. The nation so greatly loved by God had repaid Him with indifference and contempt. She had shown her scorn by embracing the vile religions of the surrounding nations and cleaving to pagan gods with a devotion she never gave to Him. The coming Kingdom will usher in peace and unity. The two houses of Israel, though scattered and rejected, will be reunited under their Messiah. Instead of Jezreel being a place of slaughter, it will be where God’s people will be sowed and restored to their land. Zechariah 10:9 And I will sow them among the people: and they shall remember me in far countries; and they shall live with their children, and turn again. …and it shall come to pass, that in the place where it was said unto them, Lo-Ammi Ye are not my people, there it shall be said unto them, Ye are Ammi: My people the sons of the living God. Hosea 2:1 Say ye unto your brethren, My people Ammi; and to your sisters, My beloved Ruhamah. While the three children teach of God’s graciousness, Gomer teaches of God’s holines. Hosea 2:1-23 1 Say ye unto your brethren, Ammi; and to your sisters, Ruhamah. He shows that sin not only breaks God’s law, but also breaks His Heart. Hosea is “Salvation”. Heb. for Joshua – Jesus. He is the only prophet that lived in the northern kingdom of Israel. He lived during the reign of Jereboam II, who ruled for 40 years. It was a time of military success, but moral failure. The boundaries of Israel were extended. Surrounding nations were fighting each other. Relative peace. With the extended borders came more economic prosperity. This time of peace and prosperity was believed to be a sign of God’s favor. Hosea prophesied during the decline and ultimate destruction of the northern kingdom of Israel in the 8th century. This was when Rome was founded. But, after the death of Jereboam II, two of his successors were assassinated, and Assyria would invade and take them into captivity. Hosea warned of the coming captivity even at a time of prosperity. He lived to see prophecy fulfilled as Israel was carried into captivity by Assyria. Hosea’s message begins with a symbolic marriage. Hosea was commanded to preach an “action sermon” to show them how they had treated God.